The Real Estate module for Statdash is a great way to get rid of white-boards so you can manage your open-to-close property transactions from anywhere, even from your phone. 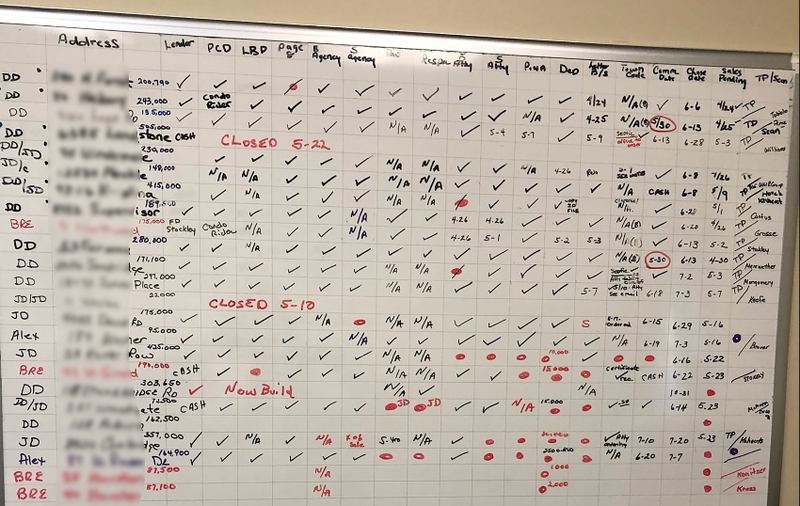 It's not unusual to see white-boards in a realtor's office that look like the one below. The only way to take this information with you is to take a picture with your phone. We knew there had to be a better way! We first launched the Real Estate module in a small office in Amherst, NY. Our goal was to make it easy to add a property, keep track of all the open-to-close transactions, simplify the communication of transaction statuses with a team (i.e., buyer and seller agents, buyer and seller attorneys, mortgage broker, etc.) and provide an easier way to share files during the process. You can use the home icon in the button bar to manage your properties and add new properties to your dashboard. As you add properties, you can immediately add your team members so they can see your dashboard and manage the properties that they have been assigned to. Statuses can now be updated along with comments by those on the team, so everyone is on the same page. You can even be notified whenever anyone updates their status. 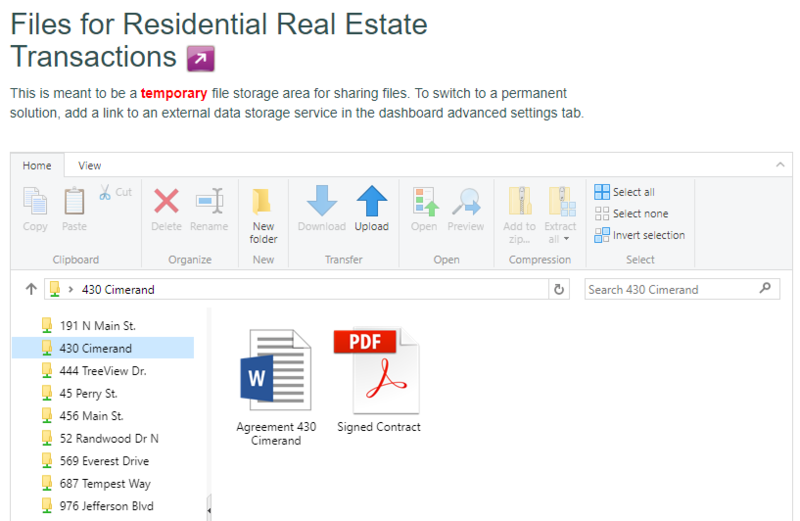 Documents can be shared by clicking on the folder icon in the button bar or by clicking on the folder icon next to each property name. 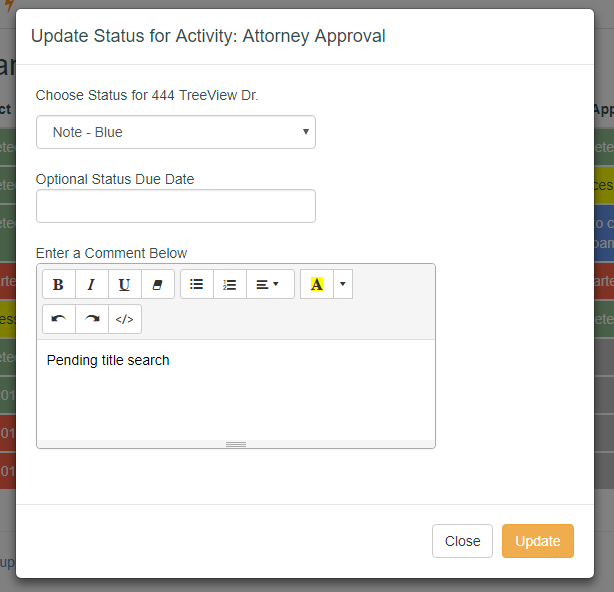 Whenever a new document gets uploaded, everyone on the team for that property is notified that a new file has been received. If it seems simple, that's because it is! There is no complicated system to learn, and everything is right at your fingertips. This is the perfect solution to a common problem.